– There are no refunds on entry fees. – Spectators are welcome for free, except during park events when entry fees may apply. – Anyone under the age of 16 with a valid Portsmouth Leisure Card is now entitled to free entry and free hire of a helmet and skateboard or scooter. All park users – riders and skaters, spectators and parents must follow these basic rules to help prevent accidents and ensure everyone has as good a time as possible. Failure to follow the park rules can cause accidents. We take safety seriously so anyone not following these rules may be asked to leave the park and/or may be banned for a period. Southsea Skatepark in 2017 reflects it’s age, mixing the legendary concrete from the 70s as one of the first skateparks in the UK (along with Romford, Livingston and Harrow) with the contemporary street/park section, which includes a state of the art vert ramp, spine mini, and a 4ft metal mini around by the cafe. 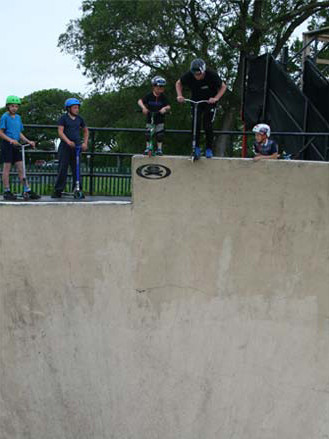 Southsea Skatepark covers a range of styles, from the snake run bowl that encourages carving and creative lines to the pool slalom run bowl that has just had a small box jump added to the top of the run. Next we have the mogul and keyhole bowl that link together and have brought so much history to the park, I think it’s fair to say visitors come and go and respect anything done in the keyhole bowl which is approx 16ft deep. It definitely adds that legit tag to anything you can do in it. What was originally the banked freestyle kick turn area, has now had a state of the art 14ft high / 40ft wide vert ramp with skate lite surface added. Next to the vert (surrounding the iconic bandstand) we have a flat bank hip and pyramid grind rail that flows into a 4ft hip into the skate rink. Back in the 70s and 80s the rink was only used for roller hockey. Around the back of the cafe area, we have a mellow 4ft metal mini that is popular with skateboarders and scooter riders. In the cafe end of the rink we have a 6ft quarter either side of the 9ft quarter (one of the oldest ramps in the skatepark) that links up to the 4ft hip into plaza section. In the middle of the skatepark we have one of the biggest fun boxes in the country, next to step up, in and out ramp used for trick in’s and out and some grind ledges and rails that can get set up in various different positions around the park. 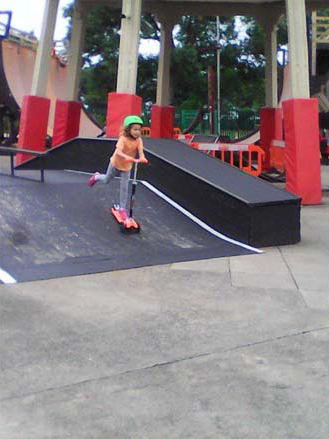 Following the faster section, we have a 7ft high quarter with flat bank wall ride next to it, 5ft quarter the other side with up and down ramp with rail down the side sheltered by the vert ramp. 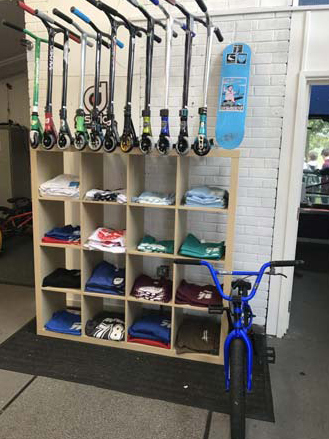 Towards the back of the vert ramp we have the 5ft wooden spine mini with pump bump that is popular with BMXers and rollerbladers – so as you can see the skatepark mixes the heritage of the park built in 1978 with the contemporary modern day street course ramps. Come and celebrate one of the oldest skateparks in the world with us. Whenever the park is open there are paid staff on duty, overseeing activities and ensuring park user safety. All of our staff and regular volunteers are DBS checked. We welcome volunteer help for a range of tasks – marshalling, repairs and maintenance, gardening etc. Any volunteers working with the park users, such as marshals, need to be DBS checked (which we arrange). If you would like to get involved, first have a discussion with our manager Effraim and then pick up a volunteer form from the park. We have a dedicated first aid room and all our staff and regular volunteers are first aid trained. 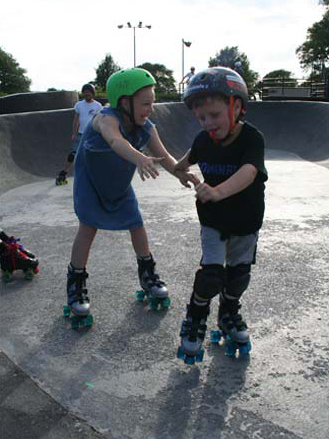 We have helmets, skates, skateboards and a limited number of scooters available to hire at reasonable rates. Please note that we recommend all users to wear helmets and ALL under 16s must do so. Hire prices are per session and include a security deposit. UPDATE: From July 2018, anyone under the age of 16 with a valid Portsmouth Leisure Card is now entitled to free entry and free hire of a helmet and skateboard or scooter. We have an on-site cafe which is run by independent operators and which serves a range of hot and cold drinks and snacks at very reasonable prices. If you book the park for a party, the cafe can also supply you with your party food. Spectators are welcome at no charge whenever the park is open, however we do expect you to observe the safety rules. We encourage parents to leave an emergency contact number for their child with our staff. Hopefully we will never need to use your number and all numbers are held in confidence. Please remember that children under 8 must be accompanied by a responsible adult. There are male and female toilets within the park but unfortunately we don’t currently have a fully wheelchair-accessible toilet.